A new legacy challenge (not authored by me) has been created that centers around the theme of theater and production. 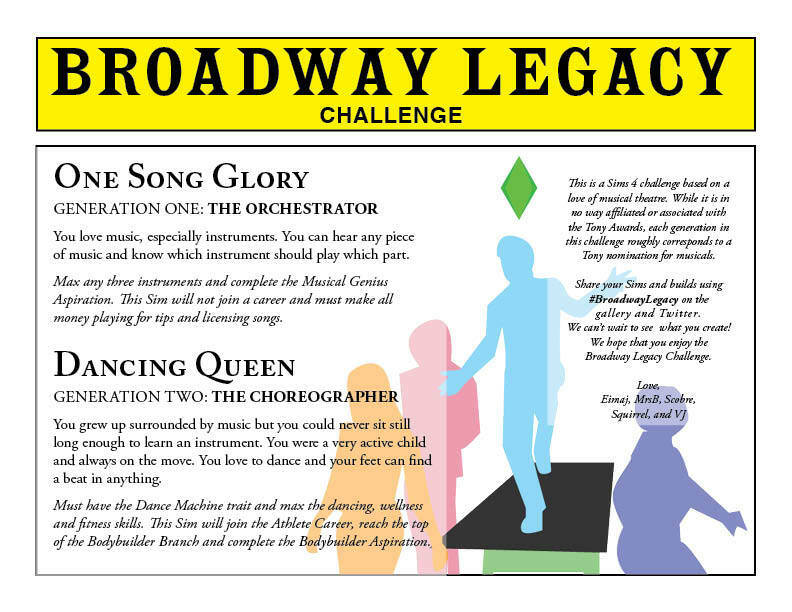 It's 11 generations and it's called the Broadway Legacy Challenge. It looks fun and not too overly challenging, and I think it'll be a fun way to max out a few skills and careers that I haven't gotten around to yet (like the singing skill or the Art Critic career). Details are linked above and below for each generation and you can also check out its dedicated tumblr for FAQs. This looks like a cool way to play. Will you be sharing your gameplay ? I'm looking to, EQ! Hopefully, I can start a save for this challenge later this week! ps: I have just the right Sim for this, maybe I should participate. I know, same here! I'm pulled in by the challenge of completing parts of the game I haven't yet explored. And to have the founder make money only from tips or song-making is intriguing! Do you think other family members could have a job? Or can the sim collect stuff to sell? I asked one of the creators and yes, your spouse can have a job and you can do collecting and gardening to help with money and bills. The founder can also use the option "Write Jingle" as they are progressing through the skill levels to make money as well. Looking at the FAQ on the link and I do not see where you need to start with zero funds. 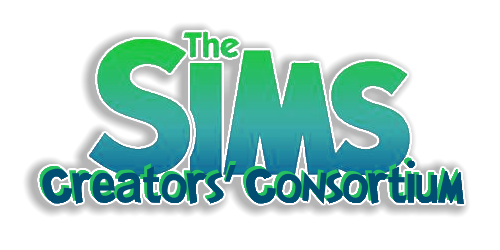 Q: Where should my sim live? A: Your founder sim can live in any world on any lot, and he or she can also move later for a change of scenery! Start with $20,000 simoleons and purchase a starter home in the game, download one from the gallery, or build one yourself. No money cheats are allowed, but you can supplement your income with gardening, collectibles, breeding frogs, purchasing the money bin or the money tree, etc. You can also participate in the lottery. Yep! This one isn't meant to be TOO much of a struggle from the start. It's more about building a legacy based on skills and careers. Though I'm sure you could go the extreme route and start with zero Simoleons if you want the extra challenge! For me it is weird to start a new save with any money. Starting with money and a house is very very strange. Yeah, you're right. I'll probably do that too! I do both, start with a home or with no funds. Keisha, my Broadway founder has no funds, I gave her a tent and a dustbin. Then I sent her to the park to fish for a violin. She is now stinking, feeling unwanted, and more starving than anything; has reached level 4 in fishing skill, but still no violin. I remember one Sim having caught three violins in one day. Where is luck when you need it??? Hahaha! "When you go looking for a violin, all you find is water and fish. Isn't that a quote? I have realized that sometimes when I'm out fishing for a cowplant that it will end up in my household inventory instead of my Sims' personal one. Last time it happened I spent all day at the park with no results until I checked the inventory in build mode randomly, and it had 9 cowplant seeds!